Kenyan security forces help people escape after a blast at Dusit D2 hotel in Nairobi, Kenya, Jan. 15, 2019. A blast followed by a gun battle rocked the hotel and office complex in Nairobi, causing casualties, in an attack claimed by the Al-Qaida-linked Al-Shabab Islamist group. The deadly al-Shabab attack that rocked a luxury hotel in Kenya’s capital of Nairobi Tuesday, killing 14 civilians, including one American, is seen by many experts as a signal of resilience by the Islamist militant group that has been battling U.S.-backed forces in East Africa for years. The attack on the Dusit D2 hotel in Nairobi contained the hallmarks of al-Shabab’s previous tactics: detonating explosives, followed by suicide infantry. But it does not necessarily demonstrate the group is resurging. Rather, the attack shows its ability to survive and execute significant attacks, according to U.S. officials and other observers interviewed by VOA. Karl Wiest, a spokesperson for U.S. Africa Command, told VOA that al-Shabab is repeatedly targeting civilians to undermine the U.S.’ relationship with its African allies. “This violent extremist group continues to seek the establishment of self-governed Islamic territory in East Africa, the removal of Western influence and presence from the region, and to further its jihadist agenda,” Wiest said. People wait to donate blood at the August 7th Memorial Park, where a 1998 terrorist bomb attack took place at the then U.S. Embassy, in Nairobi, Jan. 16, 2019, a day after a blast followed by a gun battle that rocked an upmarket hotel complex. In its statement claiming responsibility for the attack Tuesday, al-Shabab said it was in response to U.S. President Donald Trump’s recognition of Jerusalem as the capital of Israel. “Even if the Zionists and crusaders were to move all the embassies in the world to Jerusalem, the sacred land shall forever remain a noble Muslim sanctuary, without concession or compromise. Jerusalem will never be Judaized,” the statement said. An affiliate of al-Qaida, al-Shabab formed in 2006 as a militant Islamic movement resisting the Ethiopian invasion of Somalia. Over the years, the group has taken advantage of conflict and weak governance in the region and expanded to neighboring Kenya, Yemen, Tanzania and Mozambique. FILE - Members of Somalia's al- Shabab militant group patrol on foot on the outskirts of Mogadishu, March, 5, 2012. Wiest said al-Shabab’s core influence is in Somalia where it has an estimated 3,000 to 7,000 fighters. The group has engaged in fierce rivalry with IS militants who, according to Wiest, number about 250 fighters. “Al-Shabab controls roughly 20 percent of Somalia, primarily in southern Somalia, where they have maintained a historical presence. ISIS-Somalia doesn’t control any territory but maintains influence and a very small presence in comparison to al-Shabab in Somalia in northern Puntland,” Wiest said. The group once controlled large swaths of Somalia but was beaten back by a coordinated international effort such as those from the African Union Mission in Somalia (AMISOM) and the United States Africa Command (AFRICOM). Its main operations now rely on making surprise and systematic attacks on soft public targets and tourism attractions, such as hotels hosting foreigners. Last November, the group killed at least 20 people in a bomb attack targeting government officials staying in the Sahafi Hotel in Somalia’s capital, Mogadishu. FILE - People gather at the scene of twin car bombs that exploded within moments of each other in the Somali capital Mogadishu, Nov. 9, 2018, near a popular Sahafi hotel in the Somali capital Mogadishu. A Somali hotel owner in Mogadishu told VOA that many investors and hotel owners are deterred by the regular attacks, fearing their lives could be at risk, particularly if they host foreign visitors. The owner, who requested anonymity to avoid being targeted by al-Shabab, said the November bombing damaged walls and broke the windows of his hotel in downtown Mogadishu. “I was in my hotel when the attack happened. We heard a blast, and at the same moment, we heard broken window glasses,” he said. “The only thing I could say is thank God nobody was hurt inside my hotel, and we were all OK,” he added. The hotel owner said the attacks could be in response to U.S. military presence in the country. The Trump’s administration has carried out more drone attacks on al-Shabab and destroyed their leadership recently. 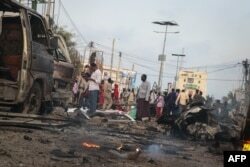 I guess it is al-Shabab’s way of getting back at them by attacking soft targets and killing people,” he said. The U.S. re-established its permanent diplomatic presence in Somalia last month after 28 years. The absence since January 1991 was in response to a civil war that overthrew the country’s president. Washington took steps to re-establish diplomatic ties with Mogadishu in 2015 by reopening its diplomatic mission but basing it in Kenya. David Shinn, a professor at George Washington University, told VOA that defeating al-Shabab in Somalia and neighboring countries will be difficult for the U.S. and its Western allies. “The International community doesn’t always agree on how to approach a problem and how to deal with it. There is always a problem of resources, how much money do you want to put into this, and more importantly, how long do you want to do it for?” Shinn said. “Al-Shabab is clearly for a long game as long as they can obtain new recruits,” he said. 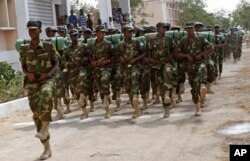 FILE - Somali soldiers march during the 54th anniversary of Somali National Army Day in Mogadishu, Somalia, April,12, 2014. Experts say building a unified and effective national army that could prevent al-Shabab violence from spreading should be at the heart of international efforts to ensure the group’s lasting defeat. The country’s security forces, despite international support, are often accused of corruption and incompetence in the face of al-Shabab attacks on civilians. Former Somali envoy to the U.S., Abukar Arman, charged that the international community has yet to take significant action to rebuild the Somali national force. “Unfortunately, the international community squanders a billion or so dollars a year, and AFRICOM squanders hundreds of millions of U.S. taxpayer dollars on biweekly drone attacks on Somalia that only create more enemies,” Arman told VOA. Increased drone attacks and the lack of an effective national security apparatus increases instability, strengthens al-Shabab’s recruiting, and bolsters the propaganda effort to spread anti-Western sentiment, Arman added. “Unfortunately, al-Shabab’s future is bright so long as the status quo is maintained and there is no cohesive, good-faith strategy to eliminate it and stabilize Somalia. 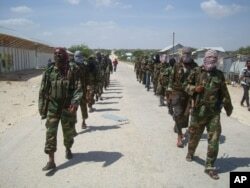 The current condition is the perfect environment for al-Shabab, or worse,” Arman said.